First of all, this is not an argument with anyone as to which is “better”, more “powerful” or a tribute to “our style does it this way and thus it is the correct way”. Whether Karate, Kung Fu, Boxing, MMA, etc., is not the issue here; I don’t care to argue with students with experience from other styles or no. I recall a student who quit after 8 years of study in Wu style Tai Chi when he said: “You are studying Classical Tai Chi and I don’t understand why. I can see where Wu Style gets its power but for the life of me, I cannot see where Classical Tai Chi gets its power”. As my teacher, Master Stephen Hwa says, “They do not do “internal” Jim, so how should they understand”. Which brings me to my next point and that is how Classical Tai Chi gets its power. For that we have to do a bit of an analysis on how Classical Tai Chi utilizes the body to derive internal motion but by means of comparison and an understanding that internal energy comes from places in the body that most do not even know exist. In external styles , the power comes from a tremendous push and surge from the back leg, driving the punch forward. I will not do further analysis on how external styles “use the hip”, suffice it to say, that the back leg acts to push and drive forward. 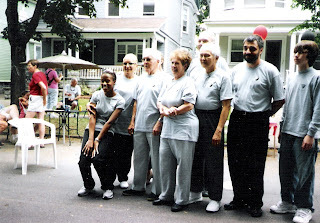 What is obvious in external stylists, or even beginning Tai Chi students with no experience however, is how their spine and lower back is tilted. Most of the students I have taught in Classical Tai Chi, come to the discipline holding the hips in a position where the buttocks are in an anterior tilt. What is an “anterior” tilt? When I ask them to stand with their back to a wall they readily see that the small of the back is normally an accentuated curve, an anterior tilt. It is of course unintentional that the hips are positioned in this manner but for the most part I believe that it is related to the lifelong habit of using the legs to push the body forward and back…in other words what we call normal walking. In moving forward for instance, the back leg pushes, the front leg reaches or some would say “swings” forward, the accompanying hip also “swings” forward and the back leg straightens. When the back leg straightens, the hips will tilt back by default. At the same time I studied Tae Kwon Do and Isshin Ryu Karate, I was also studying Tai Chi and I could notice such a contrast where the deeper my stance even when I was motionless, the more my hips seemed to tilt. Not with the “Taoist” Style, Yang Style or even Wu’s Style, but it was finally with my own personal study of Classical Tai Chi that I found how incredibly important it was for the hips to be tilted forward which is called “tucking” the pelvis or a “posterior” tilt. In the world of Tai Chi “stances”, or “frames” (the size of things), Classical Tai Chi is incredibly compact but is the poster child for the cliché’ that good things come in small packages. The tailbone is pulled under and down in a process where the spine is stretched both downward and upward if the rules about “stretching the head” up are followed correctly. When I have my students stand with their back to a wall, they readily see and perhaps for the first time, that the small of the back can be straightened. To add to the problem of taking “command and control” of a tilted back pelvis (anterior tilt) in Classical Tai Chi a beginner will find that it is also quite a distance from their pelvis to their shoulders. As a former Tae Kwon Do and Karate practitioner I had the disconcerting and sometimes painful experience as a beginner of hitting the enormous heavy bag while it was swinging toward me and finding that my shoulder gave way. I of course managed to learn to correct this problem but it is only later in my advanced Tai Chi studies that I now understand this as a corresponding “giving way” or “disconnect” in my body structure. As a beginner in Tae Kwon Do I was amazed as a beginner, at how little power I had when punching the bag. Where exactly does the power or ability to deliver force go when the hips are tucked under and when they are not? For one thing I have come to realize that the road to connecting the torso or “core” of the body to the legs, as my teacher says, goes directly through the pelvis and hips. In any fashion I can do this by tightening my abdominal muscles but what happens when I stretch my abdominal muscles? In the “anterior” tilt of beginners that I described ? Well, this “stretching”(energizing) and not “tightening” (tensing) of the abdominal muscles is exactly what happens when the hips are back and not tucked. Then we come face to face with Newtonian physics as well because we find our high school science teacher was right when he drilled “every action has an equal and opposite reaction” into us. Hitting that heavy bag with a punch “action” can only be accomplished if your force is less than the amount of “reaction” support. If the body muscles achieve a great amount of muscular energizing (there are many who abhor the word tension so we use energize) when the fist hits the bag, then the greater the power in the punch. I should point out at this juncture however, that the “internal” style of Classical Tai Chi achieves such “great muscular energizing” in a manner far different than “external” styles as I explain forthwith. There is another problem with the body’s ability to withstand reaction force and that has to do with how much strain its structure can withstand in delivering the punch. It is true that in an external punch the back leg “drives” forward but that drive is mostly in a horizontal fashion. All of us humans align our body vertically however. The horizontal “drive” line of force from the back leg intersects the body at the point where it becomes vertical. The result is an increase of pressure at the hips and pelvis…where the hips are either tucked or not tucked. One only has to think of a basic analysis of the physics involved in why sprinter’s start all races in such a crouched position. It is also easy to see that sprinter’s keep the hip very “tucked” and in fact very well “tucked” in the starting position. In that crouched position, with hips tucked, the push from the back leg will also support a great amount of reaction force and as we know a great acceleration can be achieved. It is interesting however that videos of sprinters taken while they are walking show they have almost severe “anterior” pelvic tilts and buttocks that protrude quite a bit. Humorously, these folks do not need belts to hold their pants up. 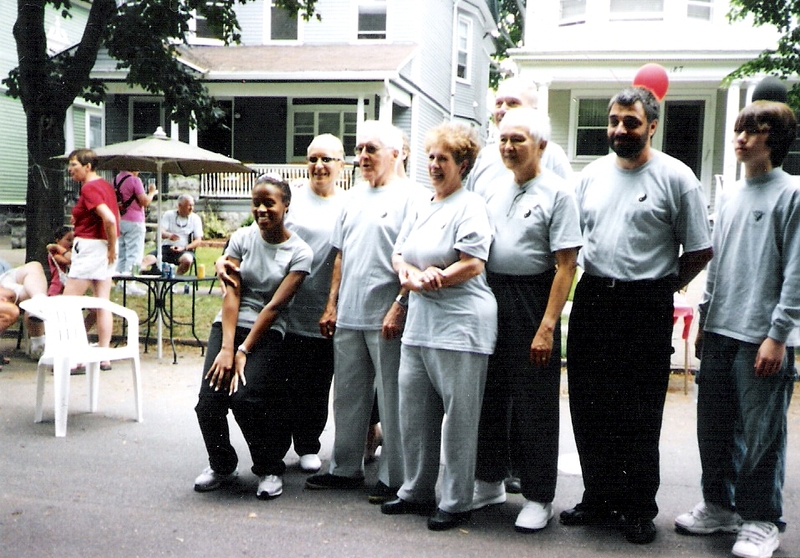 Classical Tai Chi is where it all comes together because the action at the hips and pelvis is dynamic. That is to say that the body will fluctuate appropriately between “anterior” and “posterior” tilts of the hips. The back leg is also not acting to powerfully “push off” like a sprinter. In fact, whether moving forward or back the lead leg (after all depending on your viewing angle, a “back” leg can be in either front or back) is pulling and not pushing. Quite frankly, the step size and vertical structure of Classical Tai Chi will not accommodate a powerful “push off” from the leg, it would topple your body. So the extreme "energizing" necessary to drive a punch has to come from skillful movements of the core and not the back leg. In Classical Tai Chi we call such movements “quarter body movement” and as an example, one “quarter” of the core itself is actually fully engaged with the arm. The “quarter” of the body achieves extreme energizing and then it relaxes instantaneously after the power is delivered. In doing so we can accomplish the famed “one inch punch” so popularized by Bruce Lee…but we do not have to stand in the large stance that he adopted to do so. Any muscular energizing from the core will use the back leg to act as a shock absorber to the reaction force from the punch. Not a perfectly straight back leg which had to work to drive the body forward either. Here is why we see, it is also not necessary for the aficionado of Classical Tai Chi to beat on a makiwara or heavy bag to “practice their punches”. This in contrast to the protestations of a student who lamented to both Master Hwa and I that he had not developed “self defense abilities” in his Tai Chi practice. He was going to study Wing Chun instead of Tai Chi and build a makiwara so that he could practice his “power” punches. In studying the small frame stance of Wing Chun stylists, it is relatively easy to see they also “tuck” their hips under. The disillusioned student will be right back where he was in the first place. He certainly will not achieve power if he punches the makiwara or heavy bag by holding back his hips in an “anterior” tilt from such an upright stance. Every time he punches with that tilt a great pressure will be exerted against the spine in an unusual direction. Does he also plan to straighten his back leg in such a small frame stance, thus compounding the pressures on the spine and small of the back? How will he stay “rooted” if he pushes off, or does he plan on his body leaving the ground with every punch? "The Dao of Taijiquan" and "The Tao of Martial Applications"
"Hello. My name is Bayne Lucero. I would so much be honoured to be able to study Tai Chi Chuan under Sifu Roach. I have a good friend that is a student of Chinese internal martial arts. When I called him about having an interest & advice, told him about Classical Tai Chi of Buffalo & Master Hwa, he became very excited. Saying the best book he ever read was "The Dao of Taijiquan". He also said that his teacher was a great fan of Master Hwa. Seems the endorsements are there for me. Hearing all this from my friend, his opinion I value very much, I am very, very, very excited. My phone # is. Thank you"
"I am also bcc to my students about this message, which I find opens many opportunities for interesting glimpses into Tai Chi history as well as our own lineage. It also provides opportunity to explain what we do albeit by comparison, nevertheless I found it interesting to write. Perhaps this man will digest this and come to study after all." "Jim: I know the confusion. Actually, I regret not meeting him. He is one of the few tai chi practitioner who is truly searching for the truth. Sometime, he told his students " what I taught you last month, forget about it, it is not correct. lets do this way." I'm under the impresssion from speaking to Master Stephen Hwa, that Master (see this link as well as others which are in blue font) Stephen Hwa gets the question "are you related to Jou Tsung Hwa" quite a bit. He patiently explains that his surname is Hwa and therefore no relation to Jou (surname Jou). Actually, at a World Tai Chi Day event while watching a demo of "5 animal frolics", Master Stephen Hwa told me that his family surname Hwa in original Chinese spelling is Hua. He also tells me that the family is related to this link of a distant ancestor Hua Tuo who may be the first ancient Chinese surgeon. Stephen Hwa mentions the "Dao of Taijiquan" published 1989 in his own book "Uncovering the Treasure" published 2010 and speaks of a couple of Jou's statements. In his book Hwa, (Stephen Hwa) makes reference to Jou, Tsung Hwa's statement that the "Torso Method" he mentions in "The Tao of Taijiquan, p. A31" is none other than the "Internal Discipline" explained in loving detail in "Uncovering the Treasure , p. 1 and 2, that he teaches in Classical Taijiquan. Although Jou also makes mention of Wu Jianquan style Tai Chi in his book, he states that he studied Yang and Chen styles for the most part as the following videos attest to. Here is a link to a video of "Jou" and here is a link to a video of "Hwa" and you can get a better idea of what we do vs. what Jou taught. As a matter of fact, Master Hwa has taught Classical Tai Chi to participants at "Jou's" Tai Chi Farm on occasion. He makes reference to that in "Uncovering the Treasure" where he describes a "Western Boxer's" unsuccessful and painful attempt to "take a punch" from Hwa (one inch punch popularized by Bruce Lee) without using a pad. Stephen "Hwa's" teacher at this link was Yang Wabu (Young Wabu) who later worked as a Dr. of Osteopathy after working in import/export in Hong Kong but who was highly proficient in numerous martial arts including Bagua Zhang. He was a known master of Pekkwar Monkey Boxing when he met and learned Taiji from this link of the renowned martial artist Wu Chien Chuan who along with his father had both worked as bodyguards to the emperor of China. Early on, Wu had learned the Yang Style from the members of the Yang Family themselves but as described in Wikipedia, Wu later shortened the stances and altered the "frame" in other ways. 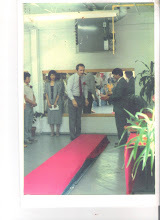 Although I studied with Wu's great grandson Eddie Wu (see this link to picture of my discipleship ceremony on web page), pictures being "worth a thousand words", for many years, even his frame is somewhat larger than the frame size we use in Classical Taiji. In addition,(since I studied with both Wu and Hwa) I am the only student of Hwa's that can personally attest to the fact that Wu does not teach internal discipline, however we do. Briefly, the Wu form I learned from Eddie turns from the hips, the form I learned from Hwa turns from the waist, for another thing it is much much smaller. As a former disciple of Wu, with great respect for the family, I can however attest to the fact that the "internal discipline" of Classical Taiji is really a return to the roots of Taiji before the styles began to change. When Yang Wabu learned from Wu Chien Chuan, he was learning from the 2nd generation. 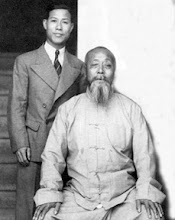 Yang Wabu used to teach classes for Wu Kung i (son of Wu Chien Chuan) when Wu was not there. Yang Wabu's daughter Sonia tells me that she was in Wu Kung i's classes, (but her father was not Kung i's student since he studied with Kung i's father Chien Chuan, Yang was Wu's colleague and not his student) and she used to fight with the men. She tells me that she was 11 years old and Eddie Wu was only 6 years old and she used to tell Eddie to stop pestering her as little boy's like to do. Having learned from Chien Chuan himself, Yang's approach was very meticulous as was he himself. My own opinion is that Gongyi (who says as much in the Qi magazine article) was very interested in attracting as many people as possible. Therefore, for one thing, Wu Kung i did not teach the square form or tight circled round form of his father but instead taught a "rounded square form". That is the form that I learned from his grandson Eddie Wu in Toronto. It is quite different from the smaller frame, (in my opinion) highly articulated square form, and compact and tight compact form that I now teach in Classical Taiji. However, Classical Taiji is still a "Wu's" style, just that as I say...it is a return to the "roots". You will just need to view my "contact us" page on my website once again and make a decision on which location you wish to study at. All the information is there, just contact me if you have any further questions or if you wish to begin study and when. If you study at the "Y", you can give the check for $65 to me and I will forward it to the "Y", if you study at the Elmwood location, it is a different situation for the 8 weeks. Remember, see these links, I only teach "silk reeling" and "basic walking" in the beginner classes at both locations. The intermediate/advanced classes are by invitation only. Please be aware, you need to email me first, due to the small amount of room at the Elmwood location, I cannot accept "walk ins". I am texting this to you for the following: Re. Tai chi. I sent an email to you but it was returned to me, perhaps it went to your spam folder? I'd like to use your letter in a blog if you have no objections and I won't use your name if you wish. I have no objections to using anything, my name, whatever. I am just very excited to start. I have not been able to sleep. My friend is so excited too. Please contact soon, I would like to sleep soon. I cannot call because I am painting the interior of the house. Come to the "Y" tomorrow night, tell the front desk you are visiting. Thank you so much for your quick response. Looking forward to it. When I told my friend you teach the silk reeling and walking, which I am unfamiliar, he said it sounds like the real deal. I mentioned Master Hwa. After telling of Master Hwa, he was about to lose it!. Thanks again.